For thirteen weeks in May-August 2018, twenty college-age students will join dozens of visiting and staff scientists at Harvard Forest in researching the effects of natural and human disturbances on forest ecosystems. The Program Assistant works closely with the Summer Program Coordinator in organizing the various educational components to the summer program. S/he provides information, advising, support and discipline required to create a hospitable academic work environment. Compensation is $14.25/hour for 40 hours per week for 13 weeks (May 14 to August 10, 2018). The assistant has a private room (room and board provided), shared office space with computer and access to Harvard Forest vehicles. The position requires on site residence with weeknight and weekend work. Must have a valid driver’s license. Please send a cover letter, resume and contact information for three references to the address below. Applications will be accepted until the position is filled. Additional information about Harvard Forest and the summer program is available at http://harvardforest.fas.harvard.edu. Shoals Scientist-in-Residence Fellowships Accepting Applications! Shoals Scientist-in-Residence Fellowships (SIRF) support early career and postdoctoral scientists for up to three-month residencies at Shoals Marine Laboratory (SML) on Appledore Island, Maine. This program provides financial support for residential research time that can be used for data analysis, manuscript preparation, experimentation, and collaboration, among others. Priority will be given to fellows engaged in SML-based science. Financial support includes: travel allowance, room and board, an honorarium, and research allowance. Fellows will be given lab/office space. Opportunities exist for fellows to have undergraduates work directly on their own research projects (advanced planning is required and is subject to the availability of funding). The aim of this program is to provide robust training for undergraduate marine science students while simultaneously enhancing the research breadth at SML. The program also seeks to increase the number of scientists from underrepresented groups; however, all qualified scientists are encouraged to apply. Fellows are asked to give at least one seminar talk to the island community during their fellowship. Fellows are expected to spend 10 hrs/week mentoring 8-12 undergraduate students in SML’s Research Internship Program. Fellows will serve as the secondary mentors, complementing the guidance of each student's primary research mentor (aka the Principle Investigators). Fellows will attend weekly internship meetings where they may be called on to provide a lecture or expertise on field research methodology or some other aspect of independent research training. Lecture time will count towards the 10 hr/week commitment. Opportunities exist for public outreach and additional income via SML’s Adult & Family Programs in August and September. 3. A 1-2 page essay describing your intended research at SML. Please include provide sufficient information regarding facilities needs for your work. Deadline for applications is 11:59pm on February 15, 2018, and finalists will be announced by the end of February. Questions? Contact Dr. Jennifer Seavey ([email protected]). 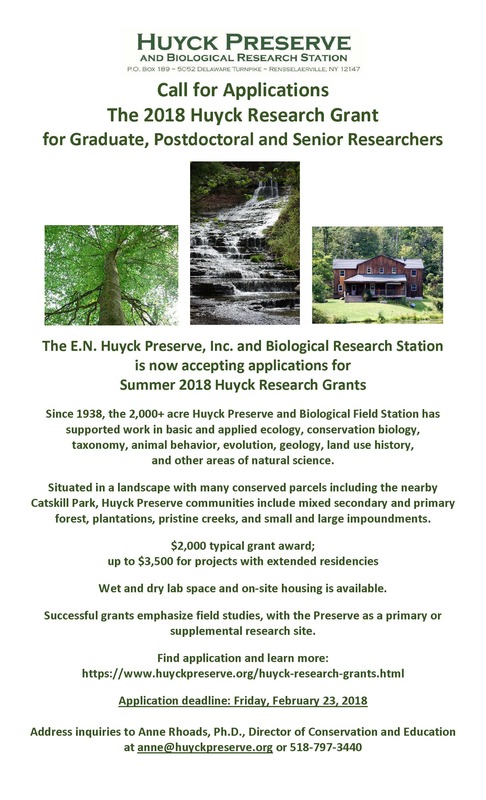 The Edmund Niles Huyck Preserve, Inc. and Biological Research Station in Rensselaerville, NY is pleased to be accepting applications for this year's Huyck Research Grants. Grant money is available to graduate, postdoctoral and professional researchers in the natural sciences doing work at the Preserve. Applications must be submitted by February 23rd. Hours: Flexible, averaging 37.5 hours per week. the HLC website; and maintain an engaging and robust social media presence. be carried out remotely, at a home office. On-site accommodation available. L’Hebert, RR 1 Port Joli, NS B0T 1S0. Researchers at Texas A&M University and Colorado State University have received NSF funding (NSF-DRL 1713359 and NSF-DRL 1713351) to study outreach at field stations. They are asking all field stations in the United States to complete a survey on their outreach programming. 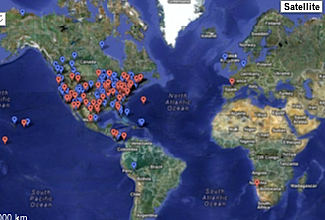 Even if your field station does not have an outreach program, they would like to hear from you! Take their survey and your station will be eligible to win $100! !